So i have built the MFT Slab table and it works great! Bigger than the MFT table, same features, and well cheaper as well. After admiring the table, I don't want to put a saw kerf into the table .. yes OCD but it looks so nice. I have read many responses on how to do this but have decided to go with a foam top. So, my question is .. for people who have used a foam top as the sacrificial top, what thickness do you typically use and how big do you make it for breaking down a 4 x 8 sheet? Do you keep the 2 x 8 sheets as is or do you trim them down a bit to help with storage and handling! For the few times that I have used foam on my MFT/3 I have generally gone with 1/2" foam. I also have some of the fanfold foam that is used when residing homes that gets pulled out. One member here who carries foam around actually cuts it in narrower strips and uses duct tape as a hinge so that he can fold it up accordion or bifold style during transport. When the hinge "wears" out then out comes a new piece of tape. That's a great idea peter, I may have to steal that one. I currently have a bunch of 3/4" dowels I glued to some 2"x2" blocks. I pop those into the dog holes to act as a cutting surface. I try not to cut into them but if it happens oh well. 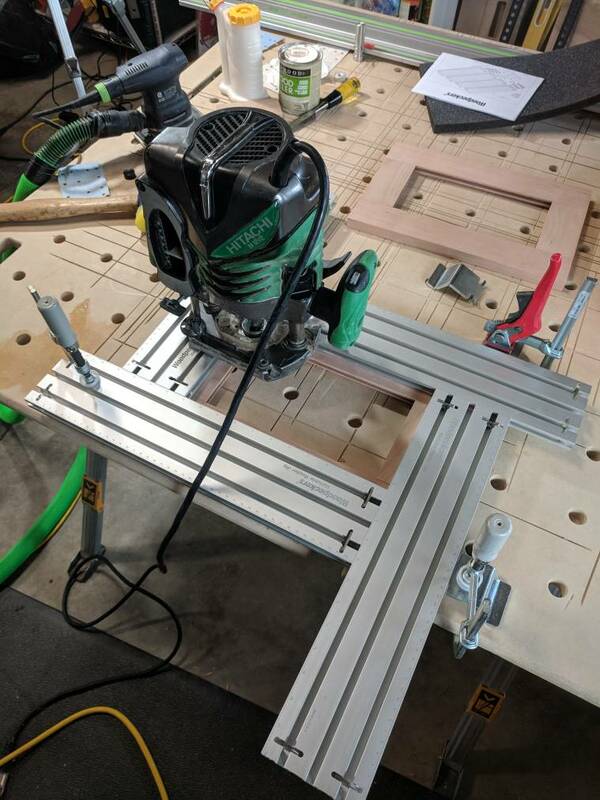 I did put a crosscut kerf in my mpt table. Resisted for a few weeks. I actually like the fact that my table is getting a little worn in. I wouldn't want kerf marks everywhere but having it a little tarnished shows that its useful. I sucked it up and ran a line in mine the first day just to get it over with lol. I do use a 2' X 8' sheet of 1.5" foam that I keep in my trailer so I can easily dimension sheet goods anywhere with the TS. Yard, floor, sawhorses, wherever with nothing else needed. I took a 1" thick section of ridged insulation which was 2 ft. by 8 ft. and I cut it into 4, 6" wide strips. When placing the 6" strips under the workpiece, I just make certain that one of the sections is directly under the cut line, the other 3 sections are placed to support the workpiece. I set my TS 55 REQ to 1/8" deeper than the thickness of my material and it works great. To store the 4 sections, I just stack them on top of each other and wrap the ends with a rubber band. This way they only take up 6" of wall space. I don't see the need to join the sections as the weight of the workpiece holds the insulation in place. If you don't like kerf marks, wait until you screw up and set the saw depth way too deep and cut a really deep kerf. My fix was to mix up some two-part plastic wood and mash it all the way into the full length of the kerf. A light sanding removed the excess and I was ready to put a new and shallow kerf into the table. Fortunately, I didn't cut into the side extrusion. If I had done so, I would have replaced it. I don't mind normal wear on my tools, but I don't want them advertising my incompetence. Could someone in UK please point me to where I can get a large sheet of suitable foam? I keep seeing pictures & videos, but all I can find is typical foil covered Celotex type insulation foam. I made a lattice of 1x2s to use like a foam sheet. Works well. It is all half lap joints cut with a dado set on my RAS. Didn't take long or cost much. I store it on the rack of my woodrack where I put larger pieces of plywood. I've always used a sacrificial piece under the material I'm cutting -- always. I use foam under larger material and MDF under smaller. I can see how your lattice of 1x2s would be lighter weight, and thus easier to handle, but, isn't the lattice an issue for dust control? I don't think the lattice affects dust pickup. It sits on my Paulk style workbench which has 20mm holes on 4 inch centers. So the lattice openings are much larger but where would still be openings if I just cut directly on the workbench. I use a Rigid shop vac pulling through a dust deputy and Bosch 5 meter hose on my DeWalt track saw. It gets most of the dust. Yes, fantastic idea about a replaceable strip! My MFT surface is just about at the point I need to flip it or do something. Heck I might even just START the MFT top with a dado and replaceable strip if I ever end up getting one! When I bought my MFT I routed a dovetail slot and made a key from UHMW plastic which can be replaced for my crosscutting. I'd be very surprised if there isn't a grid of shallow dust piles on your Paulk bench top after a long cutting session. But the scar does have some character and attests to some some historical event. If not, then I would probably be crying about my tables and radiant dial. At some point the gap needs attention. my plan is when my top gets too ugly is to put in a dado, about 3/4" wide, maybe 3/8" deep and then put in a oak (or whatever I have handy) piece in there, that can get cut and replaced easily. Ideally the dado would be deep enough to trap the sacrificial piece by the side extrusions along with some double stick tape to actually hold it in place. Use a dovetail bit on the dado and also on the sacrificial piece, load it from the end...no double-stick needed. Here is an end view of my sacrificial slot...the wider section in the foreground is epoxy to fix a mistake. This piece of UHMW is replaceable. I use 1" foam, but laminate a 1/8" skin (birch or mdf) with spray adhesive to make it more rigid. I cut them down so they store on my garage door. Helps with insulating the garage too . Use as many pieces as you need for the size sheet you're cutting .. plus very easy to haul around if you're mobile. If you're cutting on an MFT top, or other solid surface, you only need 1/2" like Peter mentioned. I just had to show you how I ended up using and using and using my first mft slab which I made using the parf guide system. Once you've cut it a few times really close together, the top of the mdf comes off in little strips, and you have a bigger divot. This one is on its way to being the sanding station for sure. I have five more now, three of which are completely done and the other two need work. Love the versatility of the mft ecosystem. Good illustration of the difference between an MFSlab and an MFTable.